De Rosa and Son Customs create an uniquely restyled 1966 Buick Riviera with styling cues from the 50’s and 60’s. The first time I saw a photo of this Custom was in 1983, when Chrome & Flames magazine had one small photo in an announcement for an upcoming show article. I was a young kid back then just starting to find my way into Custom Cars. 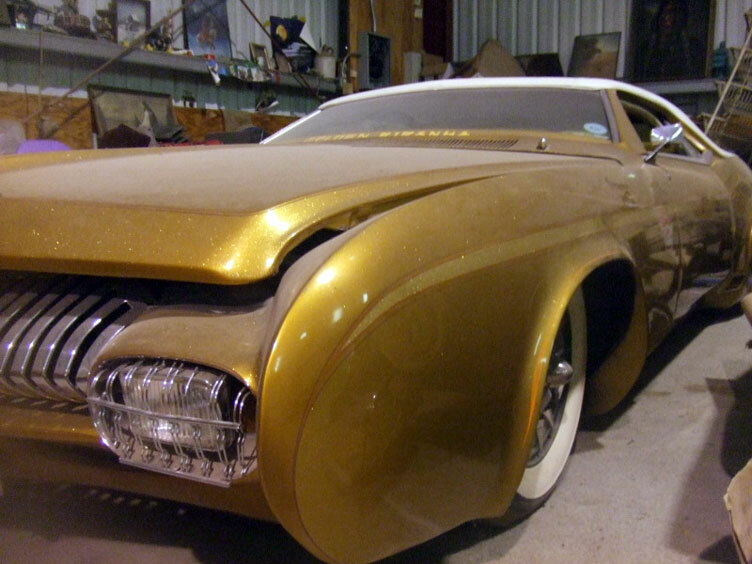 I had no idea what I was looking at, I could not figure out if this was an ’50s custom, or modern, all I knew I really liked it. I hoped the magazine would do a full feature on the car in an upcoming issue, but they never did. I had to wait several years before I was able to find out more about this car. When I bought a copy of the Hot Rod magazine Custom Cars from 1983, around 1986. 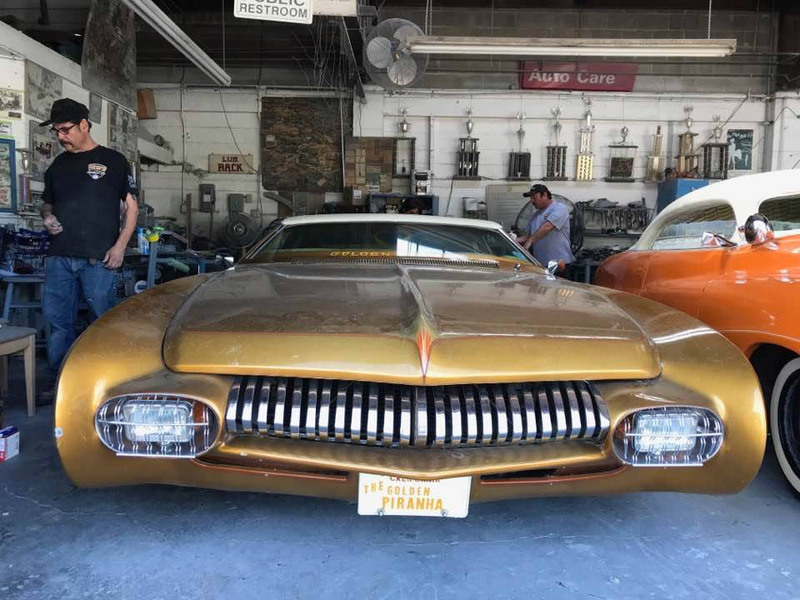 In there was a two page black and white feature on the “Golden Piranha” a 1966 Buick Riviera customized by Frank DeRosa and his son. 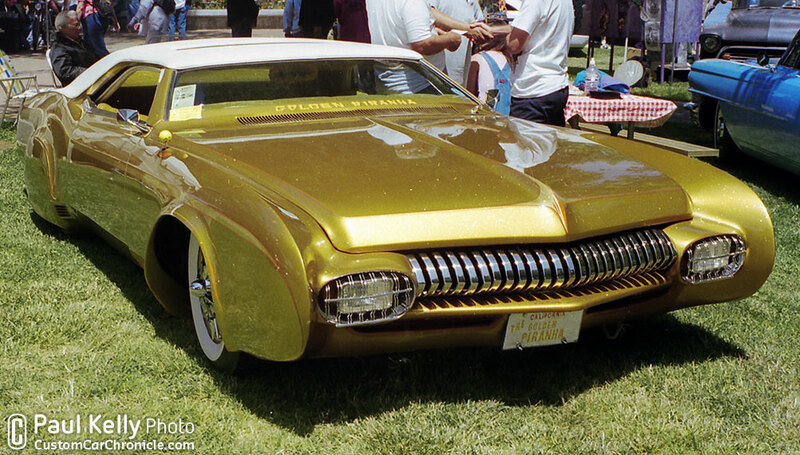 This is the first photo I saw of the Golden Piranha… before I knew what is was, or who built it, 1982. The team at De Rosa and Son Customs worked nearly two years on the project. 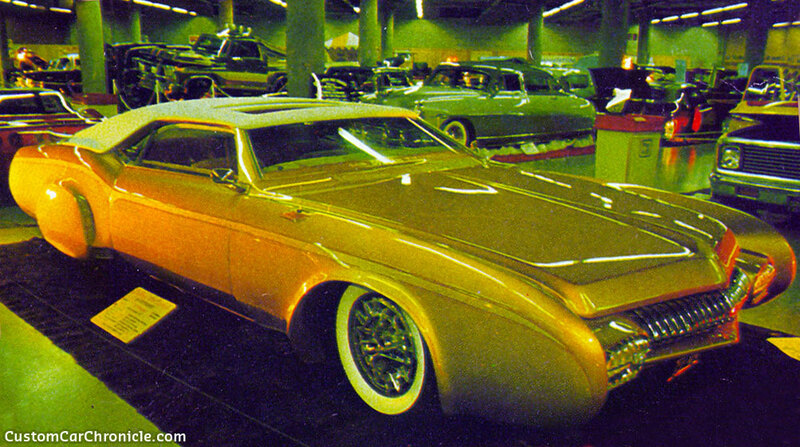 They started with a low mileage 1966 Buick Riviera, which was sectioned 5 inches and chopped 4 inched. 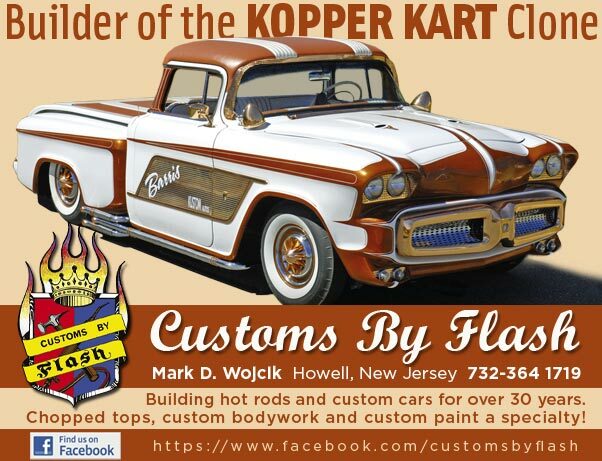 The top was reshaped to reassemble an typical 1950’s Padded style top for this late 1960’s car. 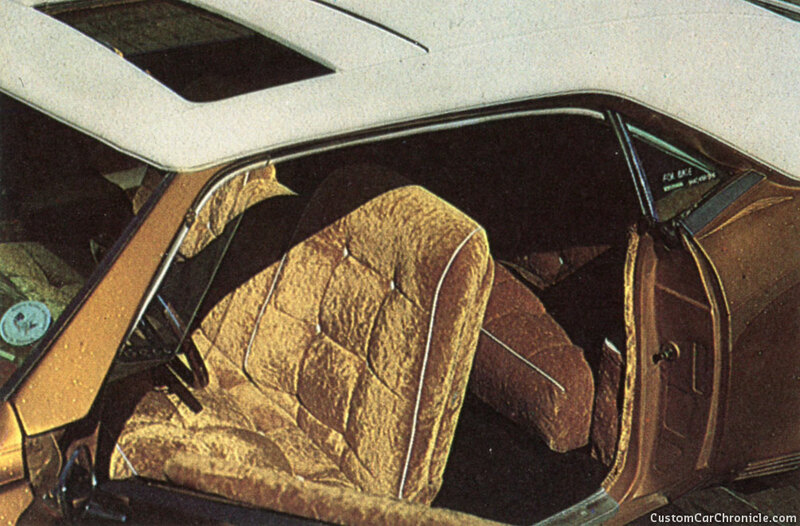 An typical 80’s feature was the sunroof in the padded style top. The front fenders were extended and reshaped with rounded front edges. The hood was peaked with an heavy peak and V-ed at the front to match the 1951 Mercury grille. Another not so obvious restyling on this car, but it works really well. The lower grille opening was reshaped to match the front of the hood and warped under as a roll pan. 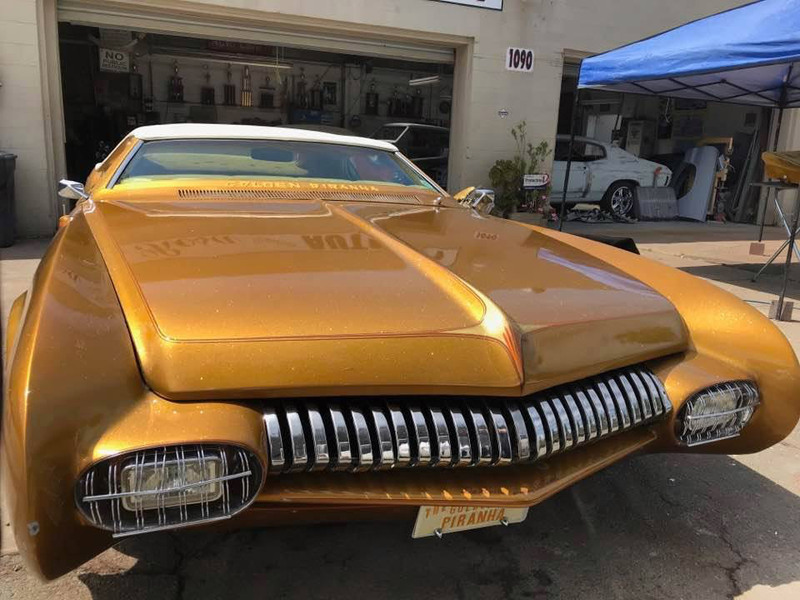 No bumpers were used on the Buick. Small square headlights were set in hand shaped pods which were covered with a chrome plated wire mesh to sort of match the Mercury grille. The wheel opening at the front was reshaped and flared, at the back the team hand made a flush fitting skirt to fit the reshaped rear wheel opening. A working air duct to cool the rear brakes was installed in front of the rear wheel opening. At the rear the fenders were extended in a similar way as what was done on the front. 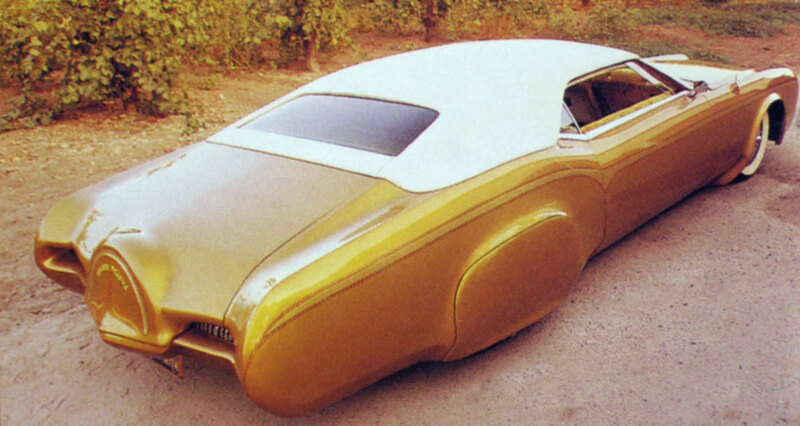 The trunk lid was extended and a spare tire cover was created using an old motorcycle fender molded into the trunk. New openings for the taillights were created and filled with left over 1950 Mercury grille sections. The lower pan was rolled under just as was done on the front. The suspension was modified and a set of full hydraulics was installed. 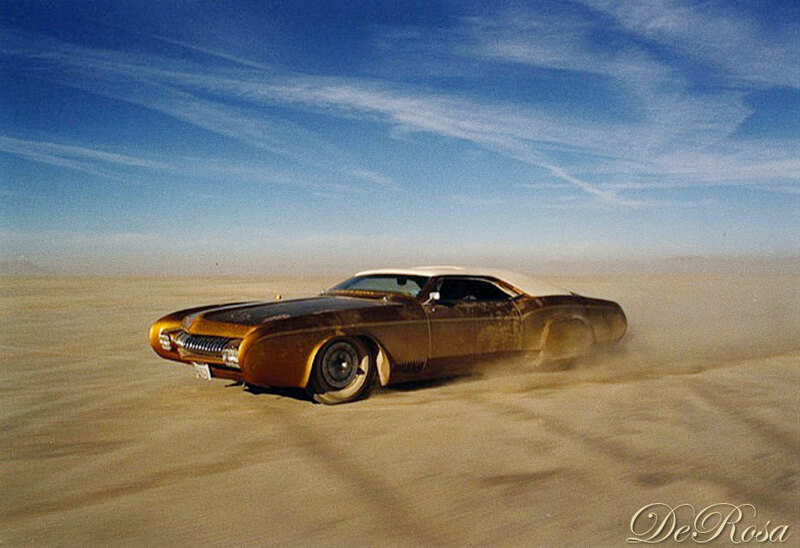 This allowed Frank De Rosa to cruise the car low over the pavement and drive at regular height on the freeway. 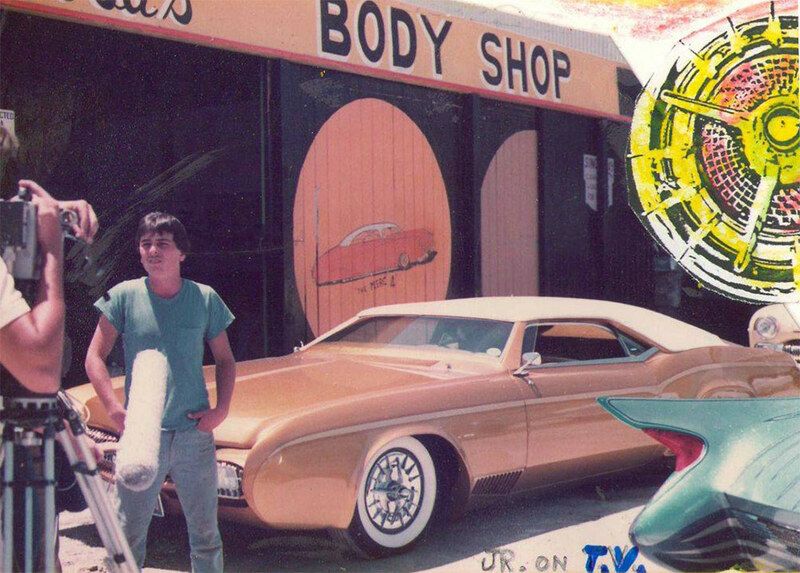 This photo of the Buick in primer was taken of the shop wall of Franks shop. Not the best quality, but all we could find from the early stages. 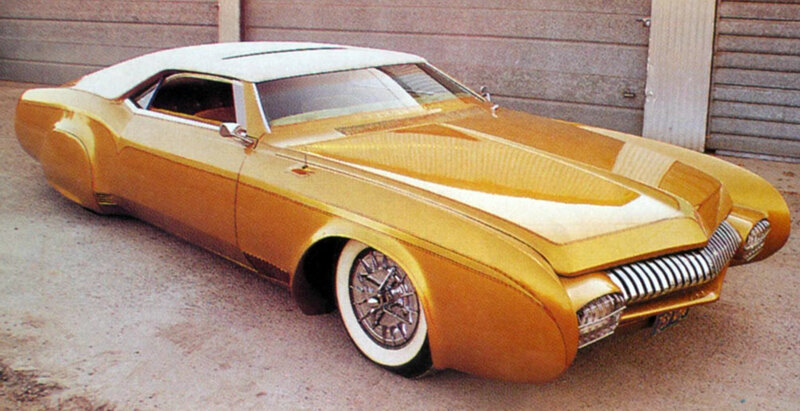 1983 Petersens Custom Cars series created by Hot Rod magazine. 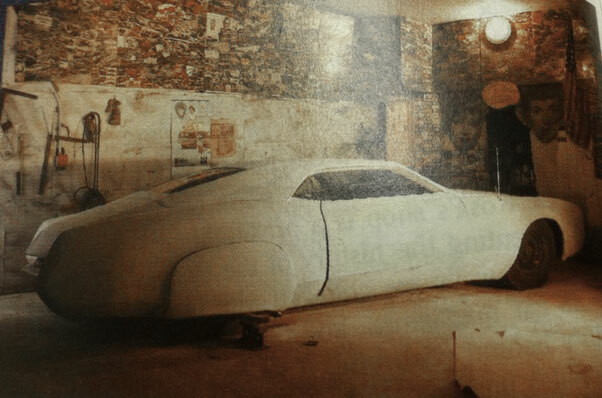 With all the body work complete the car was ready for paint. Frank choose an unique candy apple lime gold for the color. He crushed glass to add sparkle to an under-base and followed with many coats of special mixed candy lime gold. According to Frank there is no silver or gold under-base as most of these type of paint jobs required. But how he did it is still a secret. 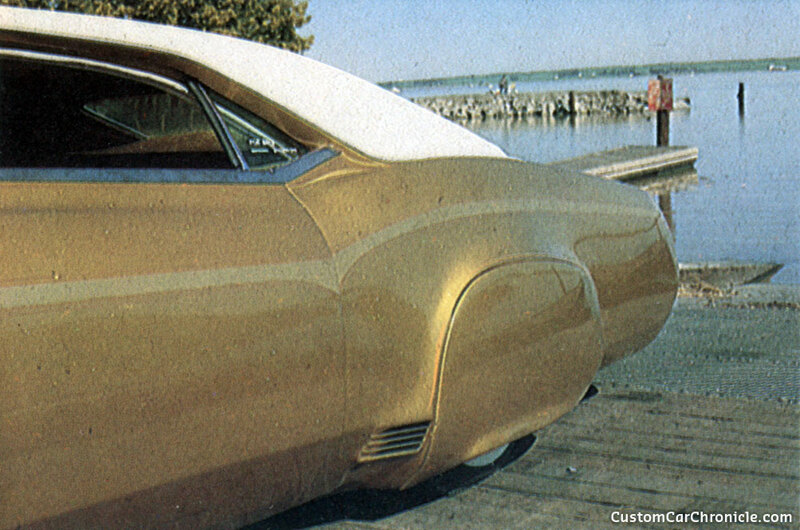 Frank used the original 1966 Buick side trim as inspiration for the graphics on the side of the car. This was done in a slightly lighter shade of gold and outlines in red and orange striping. To finish of this 1950’s /1960’s styling combinations the team added white wall tires and restyled a set of four bar hubcaps. 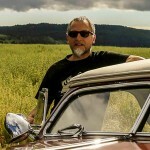 Frank enjoyed the car for a couple of years and sold it in the mid 1980’s to Bob Bowen. 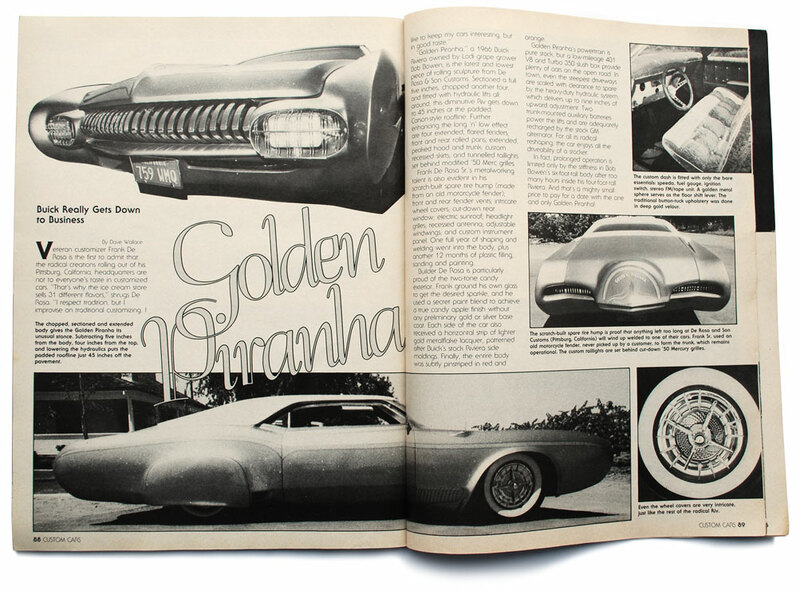 In the December 1982 issue of Classic and Custom magazine the Golden Piranha was featured with another De Rosa custom, “The Shark” The two cars were featured in full color on two pages. The photo above and four below come from this article. A good view at the custom spare tire cover made from a motorcycle fender. Nice to see the taillights glow behind the 1950 Mercury grille teeth. The working scoop at the leading edge of the flared rear wheel opening. The interior was upholstered in gold colored velour and button-tufted with white buttons and outlined in white beading. This great photo was taken by Paul Kelly from Australia. 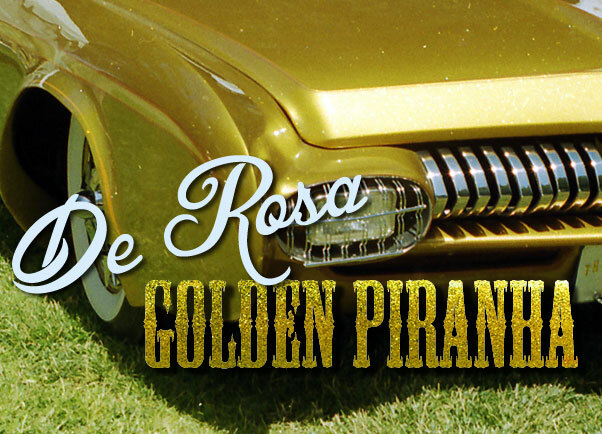 He visited and 1990’s Paso Robles event to find himself amazed by the Golden Piranha. The Buick is still around, and in relatively good shape. It used to be part of the Blackie Gejeian collection in Fresno where this photo was taken. 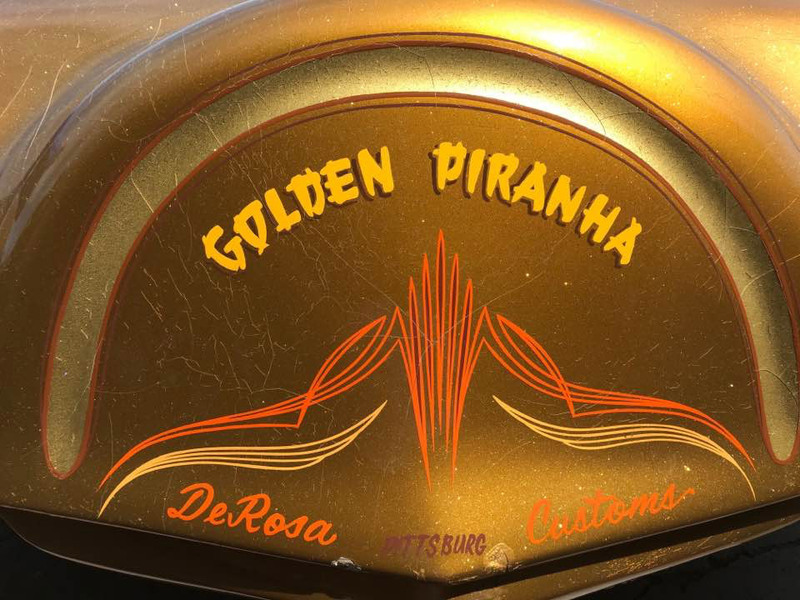 In the spring of 2018 the Golden Piranha find its way back to the DeRosa Family. 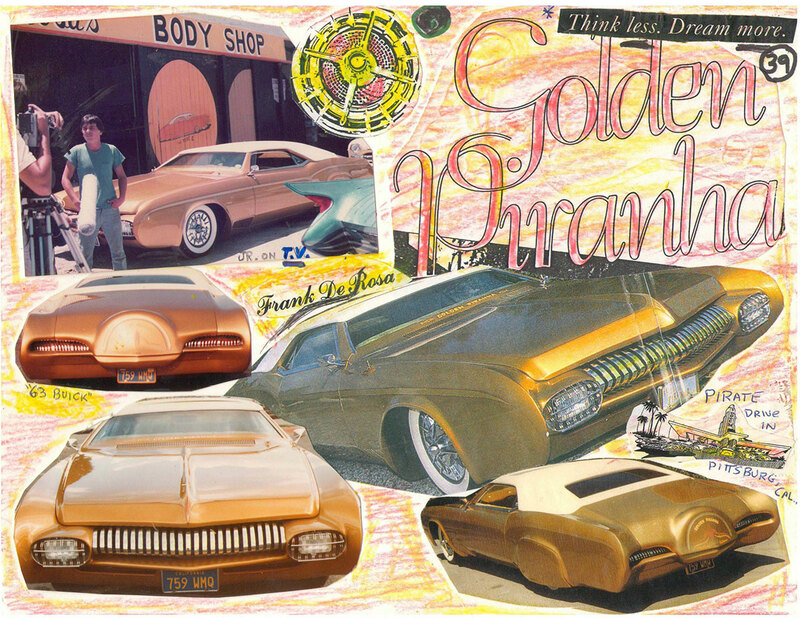 Together with Frank’s 1951 Mercury four door Custom the Golden Piranha was delivered at the De Rosa Body Shop in Pittsburg, Ca. For the first time in decades Frank DeRosa was able to see his most favorite Custom Creations in person again. 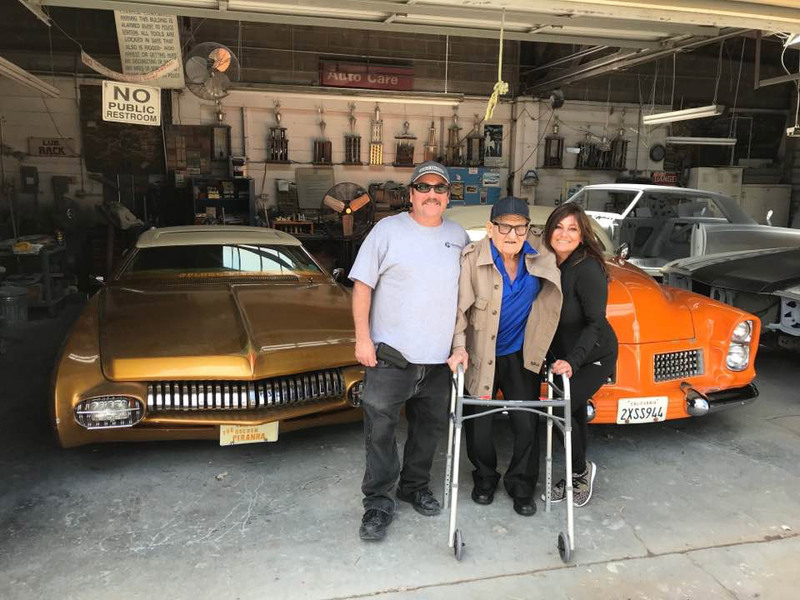 Frank De Rosa in the center, with son Frank JR and daughter Regina next to him with the Golden Piranha and the ’51 Merc at the DeRosa Body Shop April, 2018. Fresh out of the Blackie Gejeian warehouse, ready to be cleaned and detailed. 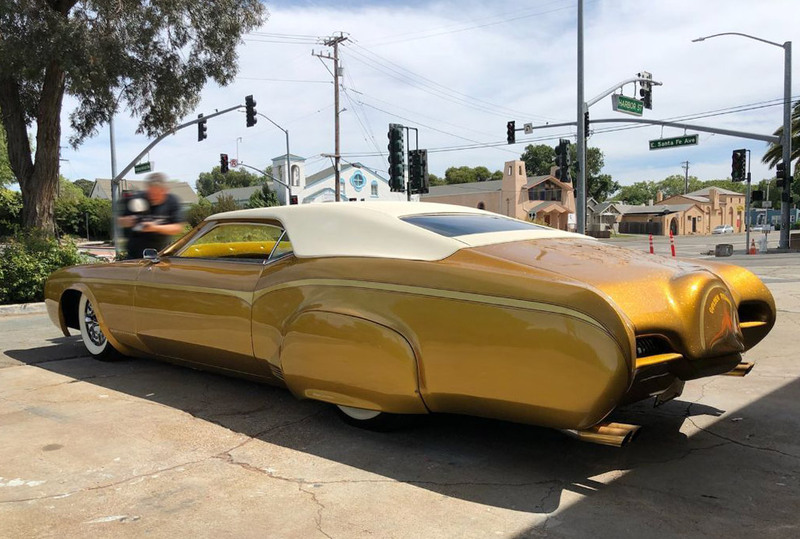 FOR SALE In June 2018 the DeRosa family decided that both the ’51 Mercury and the Golden Piranha needed to find a new home, so that the cars could be displayed at car shows and events again, and enjoyed by Custom Car enthusiast. 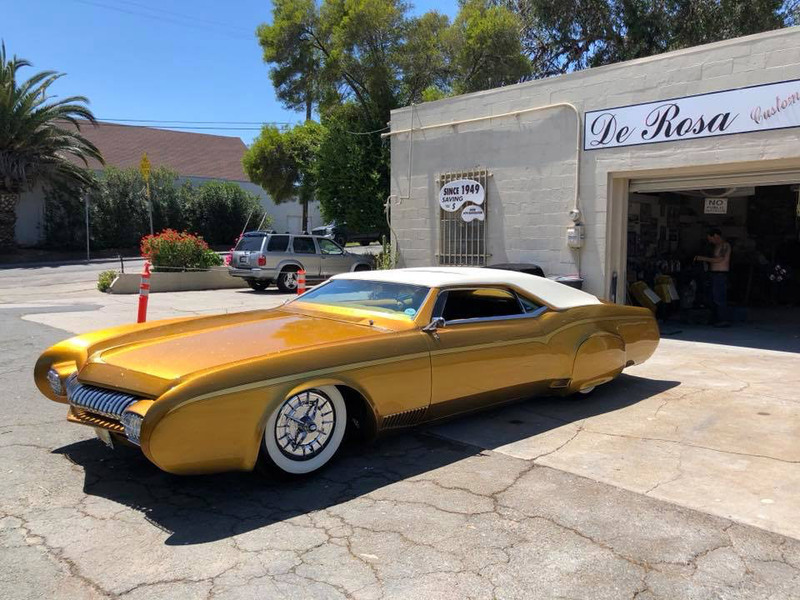 If you are seriously interested in owning this DeRosa Custom Car Icon, a Historic Custom Car, then please Contact the DeRosa family at: 925-439-5115. FOR SALE Contact the DeRosa family at: 925-439-5115. 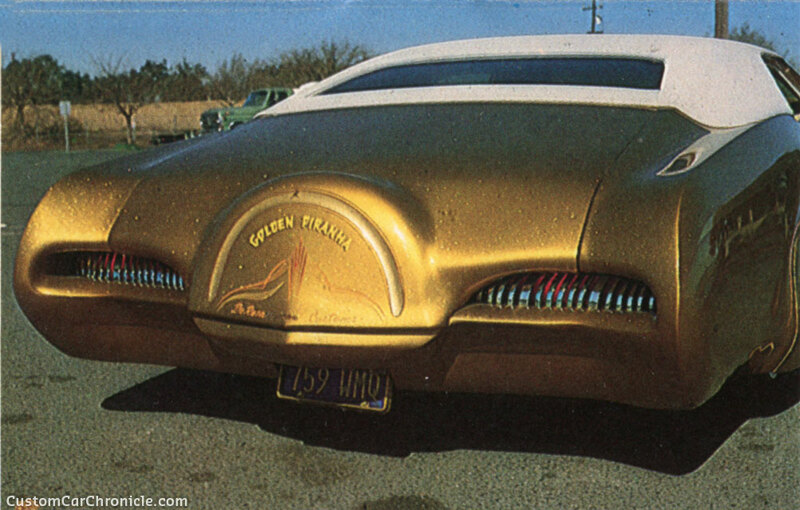 So the tail lights are made from -50 Merc grill , I didnt know , funny cause I think the front grill is -51 Merc ! This car doesnt fit a perticular style of the time (early eighties) , DeRosa team had their own style , is it a lowrider , is it a custom , chopped top with skirts , molded , not a typical lowrider alteration and shaved and molded , clear custom roots , velvet interior clear lowrider roots , anyway super cool ride and a clear statement in the early eighties customs aint gone but coming strong ! I’ve always thought this was one of De Rosa’s best cars. 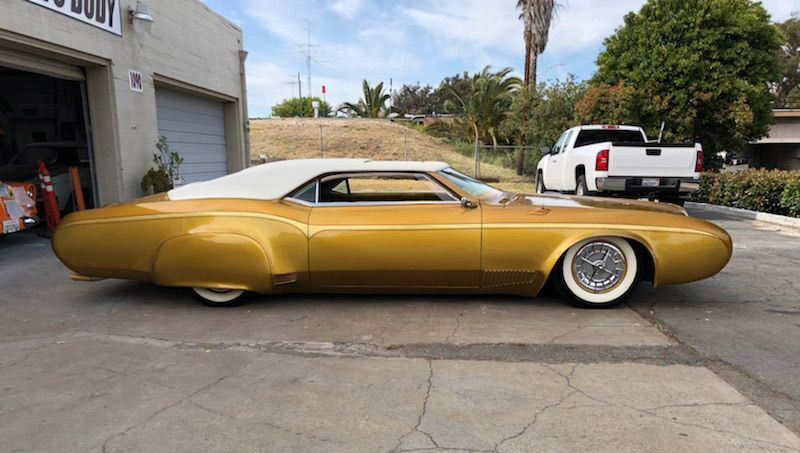 All of the Rivieras (from this body style) that you see customized are always just nosed, decked, and lowered, and that’s about the extent of it. They look ok, but there isn’t much imagination there. 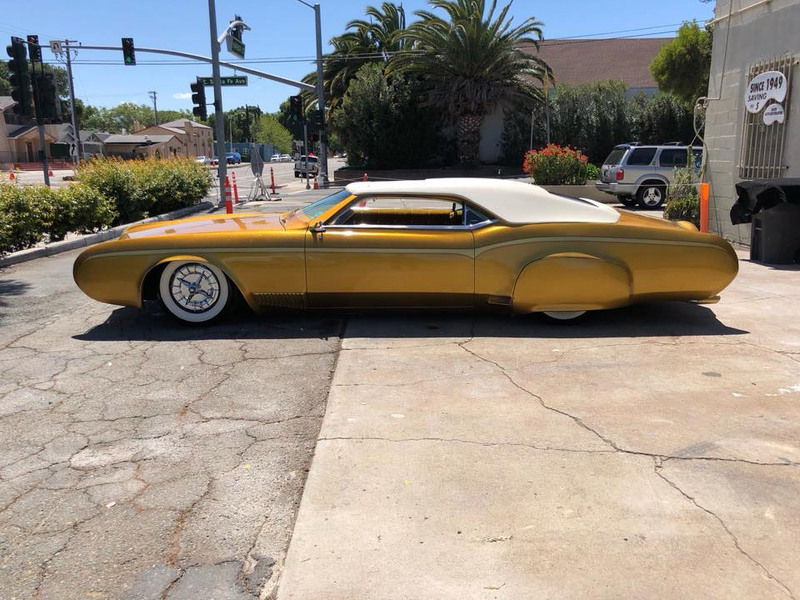 This car is more along the lines of the original custom cars from the 1940s and 1950s, with imaginative and thoughtful modifications so that you would stand apart from all of the other cars just like yours that you saw on the street. 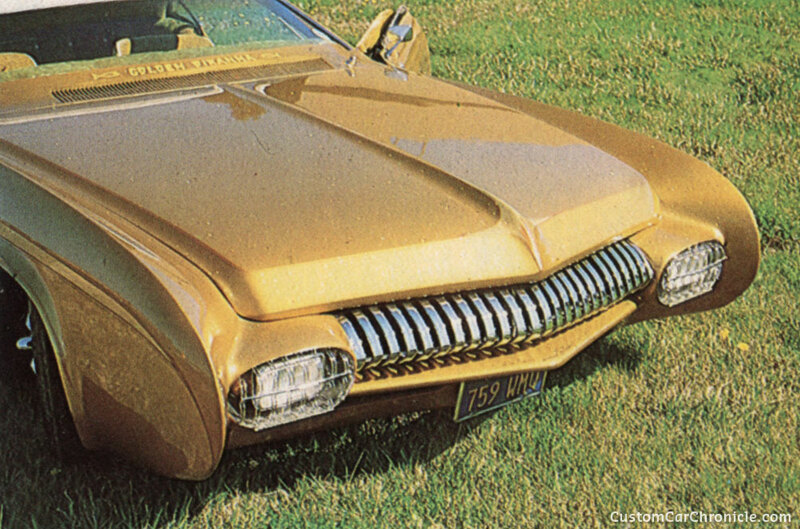 Even though the pieces making up the grill and taillights are from a 1950s car, this isn’t a case of trying to make a late 1960s car look like a 1950s car; It looks futuristic! I’d love to see this one in person!